The Atkins Diet is a low carb diet developed over twenty years ago by Dr Robert Atkins, an American heart specialist. He found that the diet he devised for his patients not only improved their heart conditions - it had the unexpected but welcome side effect of reducing their weight without calorie restriction. * This type of ketosis is commonly confused with, but has nothing to do with the ketosis that can occur in uncontrolled type 1 diabetes. In the latter case, there is no insulin to regulate the level of ketones in the blood and a build-up can lead to the serious condition of acidosis. In everyone else, insulin keeps the level of ketones in the blood within a fairly narrow range and if more are being produced than the body can use, they are simply excreted. Dr Atkins believed that the diet is positively beneficial for diabetics and certain other medical conditions, and that it is compatible with most others. Nevertheless he emphasised that anyone with a medical condition or who is pregnant should consult their doctor before starting (for instance, diabetics may find it reduces their need for insulin). The first stage, 'induction', lasts for two weeks to ensure that you are properly in ketosis and that your body has 'switched gear' to its alternative source of energy. This is the most carbohydrate-restricted stage (no more than 15 - 20 g carbohydrate per day). This level allows you a daily amount of around 120 g of salad vegetables and 130g of cooked low carb vegetables such as broccoli, cauliflower, courgettes, green beans etc, plus unsweetened soya milk in weak tea/coffee if you wish. The rest of your menu is made up of meat, fish, shellfish or poultry and fats (which are completely unrestricted as they are carbohydrate free) and eggs and hard cheeses (which do contain a small amount of carbohydrate, so you need to use these in moderation for this initial stage). You eat until you're satisfied, and should never be hungry. It is also important to drink a large amount of water, as explained earlier. There is no rule on when to eat, except that you should avoid skipping meals, breakfast in particular. The majority of fruits and certain vegetables (eg peas, carrots, onions, parsnips) can be surprisingly high in carbohydrate and most people will need to avoid these for at least the early weeks of the ongoing weight loss phase of the diet. High carbohydrate foods such as 'normal' bread, cakes, pasta, cereals, rice, pulses, potatoes, fruit juices, jam, honey, sugar etc are prohibited for most people until the pre-maintenance phase at the very least. Foods with flour or sugar as a minor ingredient, eg salami, frankfurters, high meat content beefburgers/sausages etc may be used during the ongoing weight loss and pre-maintenance phases as long as they are included in your daily carbohydrate count and do not 'throw you out of ketosis'. It is at this stage that most people find it helpful to branch out into low carb ingredients which may be unfamiliar but which allow them to increase variety and avoid becoming bored with the low carb way of eating. Examples of these ingredients are linseeds (flax seeds), sesame seeds, soya or whey protein powders (isolates), nut flours such as ground almonds (almond flour) and artificial granular sweeteners. There are now many recipe collections and cookbooks available on the Web to help low carbers learn to cook the low carb way and use substitute ingredients, such as The Low Carb is Easy Cookbook . Depending on your individual tolerance, these ingredients will enable you to have your own low carb versions of many of the foods low carbers say they most miss, such as bread, pastry, sauces, biscuits, cakes, ice cream etc. The 'ongoing weight loss' stage may last for many months, if you have a lot of weight to lose. In time, you move into the 'pre-maintenance' phase, where you keep increasing your carbohydrates gradually until you find the level of carbohydrate at which you stop losing weight. From this you will know what level of carbohydrate your body will tolerate in future if you are not to start putting weight back on. The pre-maintenance phase is designed to avoid a sudden change in your way of eating and a return to the old way of eating which caused the problem in the first place, which is a major criticism of many diets of the calorie restricted type. The final, 'maintenance' stage is reached when you have reached your weight loss goal and found the highest level of carbohydrate at which you maintain your weight or feel best. If you do break your maintenance regime, all you need to do is return to the induction diet for a few days to start the ketosis again. When you are in maintenance you bring back as many of the 'good' carbohydrates into your diet as your carbohydrate tolerance allows. 'Good' carbohydrates are vegetables and fruits, pulses and whole grains. Refined carbohydrates such as white flour and sugar, and their frequent companion hydrogenated fats and oils should not form part of your regular diet. As you bring more variety back, the percentage of protein and fat in your diet will naturally decrease from the levels seen in Induction and Ongoing Weight Loss. 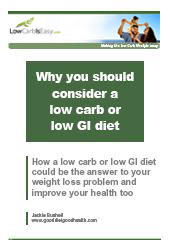 A free e-book explaining why a low carb diet may not only be more effective in helping you to lose weight, it may also be better for your long term health too. 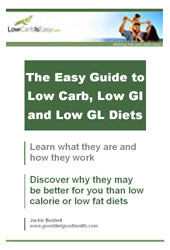 A quick and easy guide to all you need to know about how low carb diets differ from the conventional low calorie/low fat diet and the science behind them, how to choose the best diet for you, how to do your chosen diet and tips for getting started. Fourteen days of original carb-calculated menus for dieters on Atkins Induction and other low carb diets. Twenty-one days of original menus for dieters on low GI and low GL diets. There are many mechanisms at work which can prevent you from losing weight, no matter which diet you try. These are explained in "Why Can't I Lose Weight - the real reasons diets fail and what to do about it". "I found this book to be filled with practical medically-based answers to many of the questions about weight loss, plateaus, healthy fat loss, metabolism and why the weight so often comes back no matter how 'good' I am on my diet. 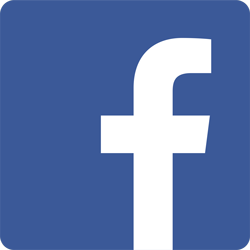 Jackie Bushell introduces her readers to current, relevant and proven facts about low calorie, low fat, low carb, and low glycemic diets. This book helps clear the fog of myths and unsupported claims and shine a logical, detailed light on diet and healthy weight loss facts. 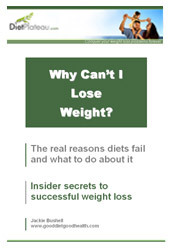 'Why Can't I Lose Weight' contains a lot of common sense and medically supported nutritional information that is applicable to a great many frustrated dieters, just like myself. I experienced many "ah-ha!" moments while reading through the pages. I especially recommend this book to anyone who suspects there could be an underlying health issue causing them to be resistant to weight loss."